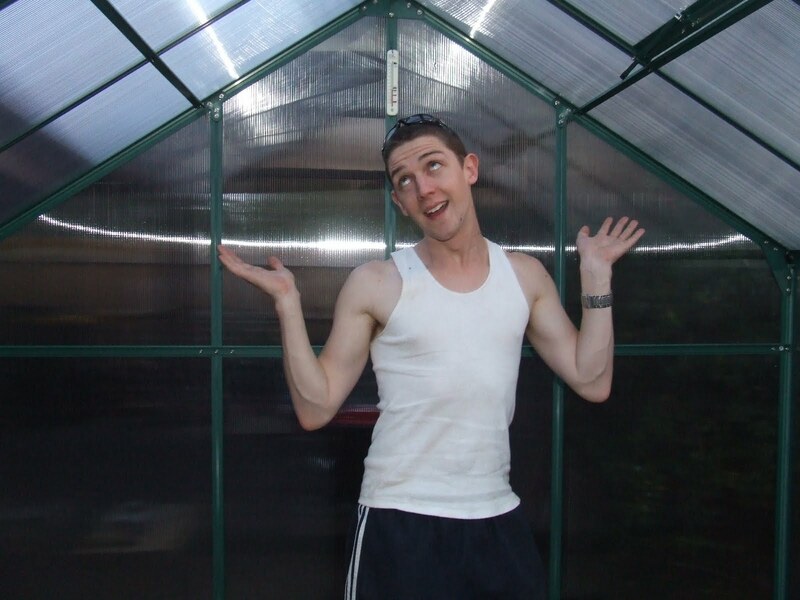 My son Adam enjoying the Greenhouse! 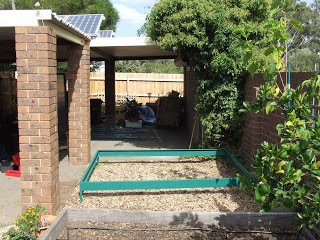 I think it was during the Sustainable Homes day that I visited your place and saw your greenhouse. It took me a few months to get the motivation to set it up and a further few weeks to finally bolt it all together but it’s done. As you inspired me, I tried to find out some more information on the greenhouse from your website, but I couldn’t find anything. Can you please give me some pointers? Firstly, the four feet at each corner of the base, did you just jam them into the soil so the base is flat on the ground? 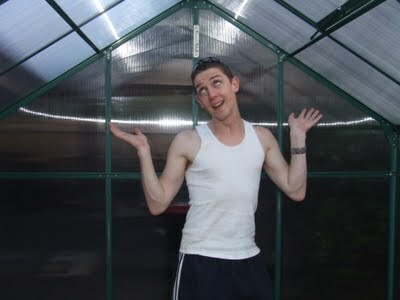 What’s the base of your greenhouse covered in, crushed rock or recycled crushed brick? 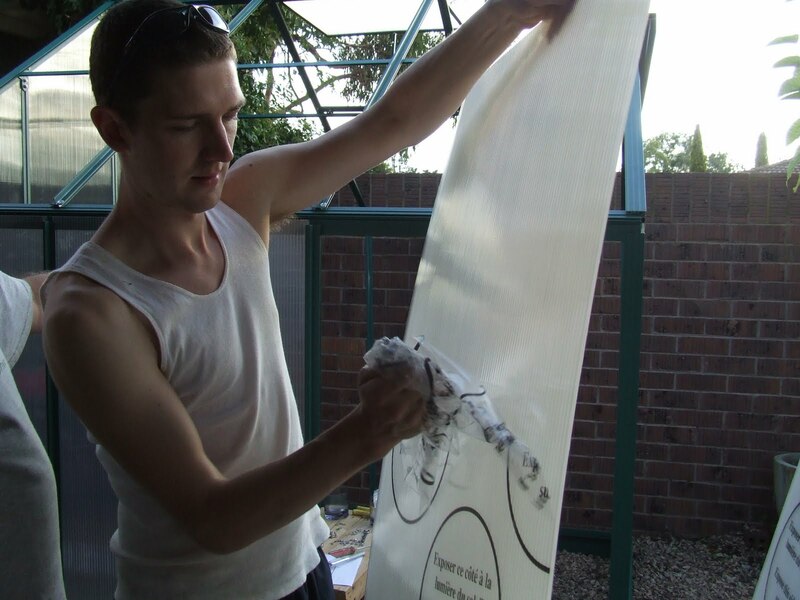 Did you seal the polycarbonate sheets with silicon along the aluminum parts? 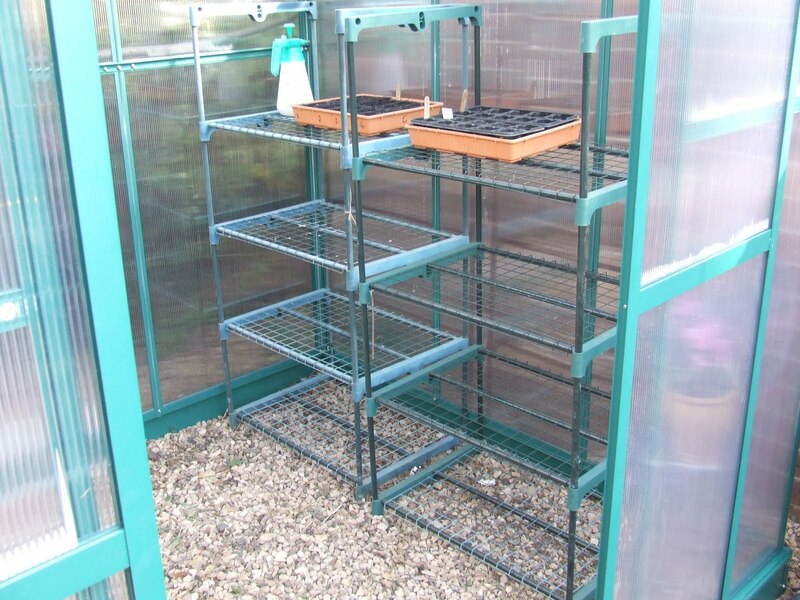 With the shelving did you buy separate portable greenhouse shelving and put them inside? With your seedling labels, have you found any ‘eco-friendly’ ones or just the plastic paddle-pop things from Bunnings? 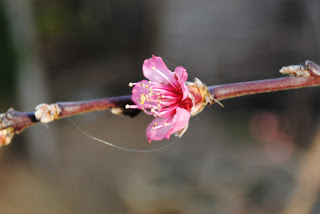 With your fruit trees, what made you decide what to buy? As I’ve only got a 1kW PV system installed, would you add another more powerful system? How did you decide on how many panels you needed? Sorry to ask all these questions, but it’s frustrating doing it all myself. Answer #1. The base of the greenhouse was bashed into the hard clay that we have in this neck of the woods, so it did not need any concrete. The base did have spikes that were about 30cm (1′) long and it has not moved since. After it was hammered into the ground with a rubber mallet, I made sure it was level. Answer #2. The ground was already covered in crushed rock, which I simply pulled back from the frame, then backfilled when in place. It has kept it very sturdy. Answer #3. Walls. I did not seal the polycarbonate sheets, and have only had one pop out because I was silly enough to leave the door open when it was very windy. They are a pain in the bum to put back in! Answer #4. Shelving. I bought the shelves separately, and re-purposed an old one that I had. 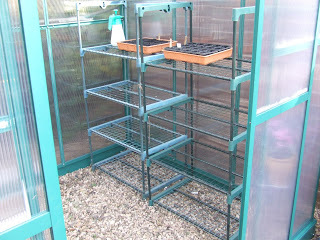 They are just cheap small greenhouse frames, that would normally have a PVC cover over them. Answer #5. As for eco-friendly labels, I simply cut up an old ice-cream container into strips and marked them with a permanent marker. When I am finished with the label, I wipe it with a bit of methylated spirits to remove the writing, and store it back in my seed box. Otherwise, I use old wooden ice-cream sticks from iced lollies. Answer #6. Fruit trees. I asked the family what they liked to eat, bought those varieties on dwarf root stock, and planted the deciduous trees (stone-fruit, apples, pears) in the front yard which is north facing so that sunlight still warms up the house in winter, and planted the evergreens (citrus) to the south and west of the house. Where I couldn’t source dwarf roots stock I planted them in pots. Answer #7. Solar PV. It all depends on your consumption of electricity. If you are energy-wise, then 1kW will be sufficient, however if you are like the average Australian family and use over 16 kWh a day then it will only reduce you power bill by 25%. You can read about how I went about reducing my electricity consumption at the post titled “Eco House Challenge Electricity 1“. Answer #8. Just remember it is cheaper to save a kilowatt than it is to make a kilowatt of electricity. 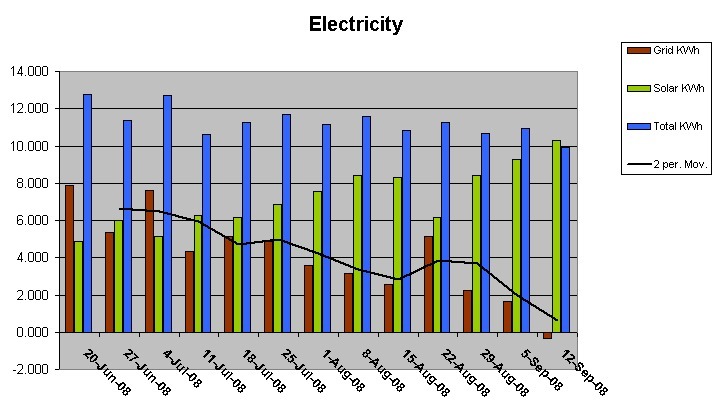 I sized my system based on 75% of my energy usage of an average 12 kWh per day and I was way over generous. I now produce 120% of my energy needs, as two children have left home since I installed the system back in September 2007. Well, I hope everyone got a little something from Richard’s email, as I certainly enjoyed replying to it. 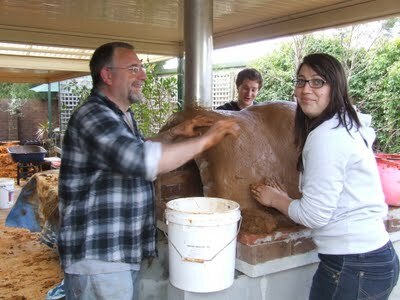 I inspected the oven on Thursday, and there were large cracks that had opened up in the first layer, so on Friday, Kim and Ben made up a mix of 66% sand, 33% clay and half a bucket of straw. They made a layer that was about 3cm thick all over, and we let that dry. Well guess what? That fixed the cracks. 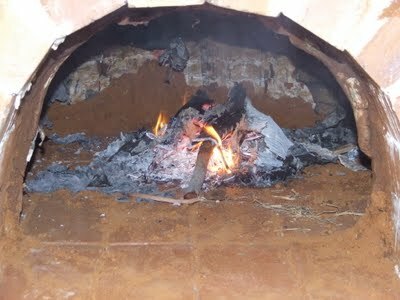 So Saturday morning was the first firing of the clay oven to harden the inside which was still damp. After a few minutes, we had a small fire burning well. Here it is in all its glory. 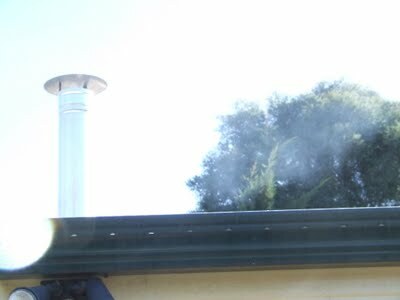 But is the flue working? Why yes, there is definitely smoke and hot air going up the flue, and very little coming out of the door arch. It works as designed. The coals are glowing red. 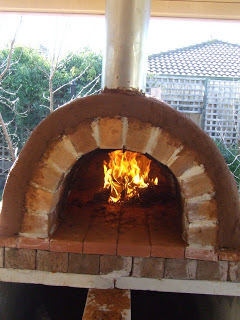 The initial firing only lasted about 30 minutes, as I didn’t want to heat it too much and crack the inside any more. So, upon some valued advice from a fellow blogger (thanks Tracy), we made up a large batch of cob to make a thick layer to add to thermal mass. This batch was 75% sand, 25% clay, two buckets of straw (including a bit of dried chook poo). Ben and I did the mud dance and we mixed it until we could roll it in our hands and it didn’t stick to them. 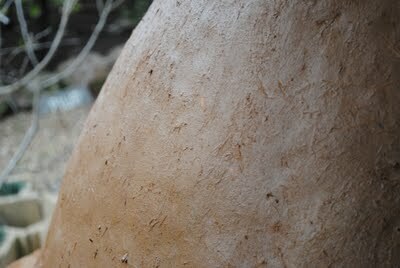 Then Kim wet the dome, and slapped on big wads of clay about 5 cm thick (2″). As we added this layer we smoothed it out. Then my daughter Megan and her boyfriend Jake turned up to lend a hand. Here we are finishing the 3rd layer off. 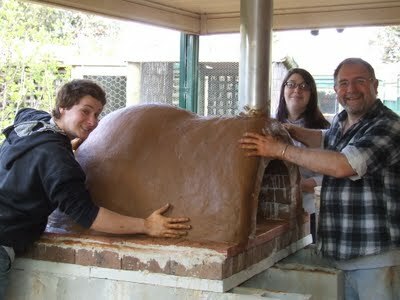 The final smoothing whereby we bashed the oven with our hands to make sure that any air bubbles were removed. Nice and smooth. The dome is now about 15cm thick and the layer around the door arch about 10cm. The front view with the ashes of the first firing. 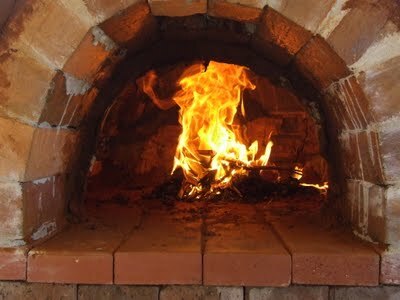 Here is a close up of the surface of the oven. Note the large amount of straw all the way through. One final inspection , and we are done. 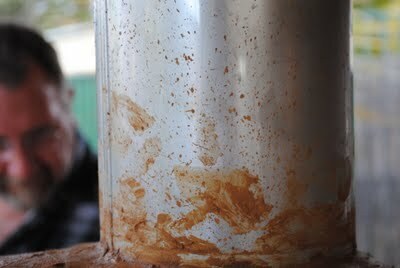 The clay came off of the flue with a damp cloth. Directly after this shot, I fired it again to help the new layer dry quickly. 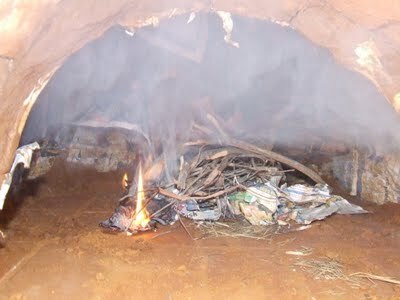 It worked like a charm, and I kept the fire going for two hours this time, still small, and not a raging inferno. The inside is as very hard now, and the outside is drying nicely, with only hairline cracks which are easily smoothed over. The top of the dome gets warm, but never hot enough that you cannot hold your hand there. 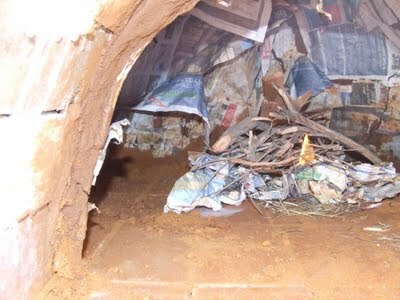 I have given away the idea of an insulating layer with chicken wire and render, and will only add a final render of sand/clay, and a little cement and lime (with an oxide added) over the surface to smooth it all down. This will allow Kim to add mosaic tiles, all over the dome. I am looking forward to the artist doing her magic! 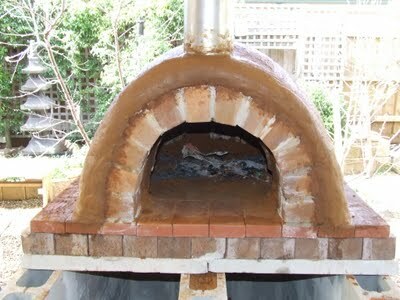 I will fire the oven each night this week, so that before the final render goes on, were should be no more cracking. For those wondering about the clay pavers that I used for the floor of the over, well great news, there has been no issues at all with them, with no cracking and they are simple to clean afterwards. Next weekend, I will also make the mantle to go at the front and the door for the oven. That will be the finishing touches, other than two doors that I am going to make for the wood storage. I am so pleased with this oven so far, and now wonder why I procrastinated for so many years! We are all looking forward to actually cooking something in it. My inquisitive mind was wandering all over the place on the way home tonight. 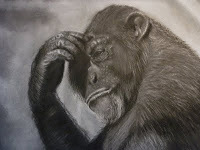 I am going to share my thought pattens, even though sometime it may seem a little out there. Here goes trendsetters! First my thoughts were drawn to the preparation work that Kim and I have to do this weekend for Sustainable House Day. Call it a spring clean if you will. Weeding, tidying, building, etc. Should be a great weekend I thought. 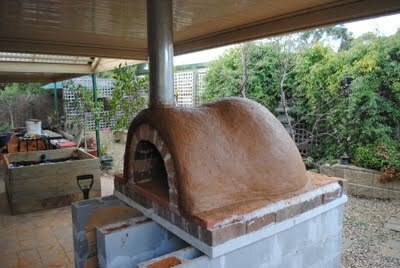 Building a wicking bed, and adding another layer to the cob oven and fixing up some cracks. Then I thought deeper about the concept of Sustainable House Day, and that one day it will not be needed. That day would be when everyone grows their own food out of necessity, and has chooks, fruit trees and veggie patches, and lives within their means. Whether it be because of peak oil, or climate change, or economic downturn or all three is besides the point. The fact is that it will probably happen and I thought that I am glad that I am well down the path towards a more sustainable lifestyle before TSHTF even if it does happen in very slow motion. Then I thought about the most unsustainable house that humans have ever made. The news today talked about a Russian unmanned space craft that was ferrying supplies to the International Space Station. The ISS would be in my humble opinion, the most unsustainable house in existance. It has to truck in food, oxygen, water, and everything else that humans need to survive, and don’t even try to work out the food miles! Yes, it may be expanding our knowledge of space and science, but the costs to maintain it must be enormous. No wonder NASA canned their manned space program. Then I thought about the most sustainable house. A Yurt came to mind, and so did a Wattle and Daub hut. 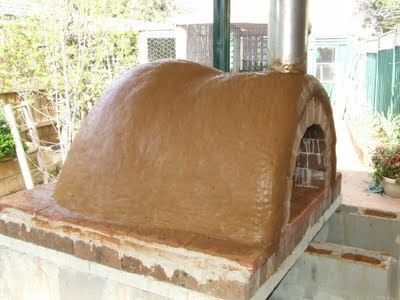 Easy to maintain, weather proof, easy to heat/cool and the materials are low cost. Very sustainable, and probably very comfortable. I kind of went off track in my head about this time as I began to actually listen to the podcast “More Hip than Hippy“, which I enjoy on my commute and have a laugh once in a while. Val and Dori were talking to a lady somewhere in California that gets by without a car, and who lives in the ‘burbs. Big deal I thought, and they were waffling on and on about how hard it is. Yes this lady’s hubby had a car, which they jointly own. Well that is not really getting by without a car now is it. I might as well interview Kim on my podcast and ask her how she gets by in the suburbs without a car! Same thing really, as we only have one car, and Kim chooses not to drive at all. So underwelmed I felt, I skipped past that part of the podcast. People must be really attached to their cars in the US, I suppose a bit like Aussies when I think about it. Then I started listening to the Kunstlercast, and James and Duncan were talking about the Standard & Poors downgrade of the US governements credit rating, and The Long Emergency. High unemployment, housing prices/values falling, people just getting by with crap jobs, and not many people taking about peak oil like James does constantly, which is quite important to the US seeing they use 25% of the worlds oil resources. A little blip like a revolution in an overseas oil exporter and they have to start eating into their oil reserves, which is dwindling all the time. He also talked about the leadership stalemate (or lack of said leadership) and that he was waiting for some left wing equivilent of the Tea Party to start up and start doing the things that the Democrats are, in his opinion, not capable of anymore. Sound a bit like our Green party to me. Then I thought that things just don’t look very pretty for our allies. However I could have it all out of context, because I just listen to podcasts from the US, and am not living the experiance. My mind turned to transport, and the lack of a good public transport system. Traveling on the train in the mainland capitals of Australia is very ancient Rome like. All roads, and in this case, trains, lead to the city center. A truly well designed rail system would have orbital lines that connected all of the lines to each other at various distances from the city center, a bit like NY, Tokyo, London, and Paris. I remember that traveling in London and Paris when I was in my 20’s and how easy it was to get around on the Tube and Metro respectively. All because the systems were well planned out and interconnected. Interconnected. I then remembered that we are all interconnected in the world, this world of Globalisation, and wondered how much longer it would last. Cheap trade is not possible without cheap fossil fuels and now that is a thing of the past the cracks in the fabric that holds Globalisation together must be streaching hard at the seams ready to burst. Then I pulled into the train station and traveled home in my hybrid car. I wondered when more cars would be manufactured as hybrids or electric, and wondered when the price of petrol (gasoline) was going to get so high that people would start to abandon their SUV’s and massive 4×4’s on the side of the road because they couldn’t give them away! It was about then that I pulled into the carport, met the dogs at the door, and gave Kim a big kiss and a hug.